Mark Campellone has been building archtops guitars since 1988, and since the early 1990s has focused exclusively on building these instruments, now in Greenville, Rhode Island. His guitars are well known for their high quality and attention to detail. 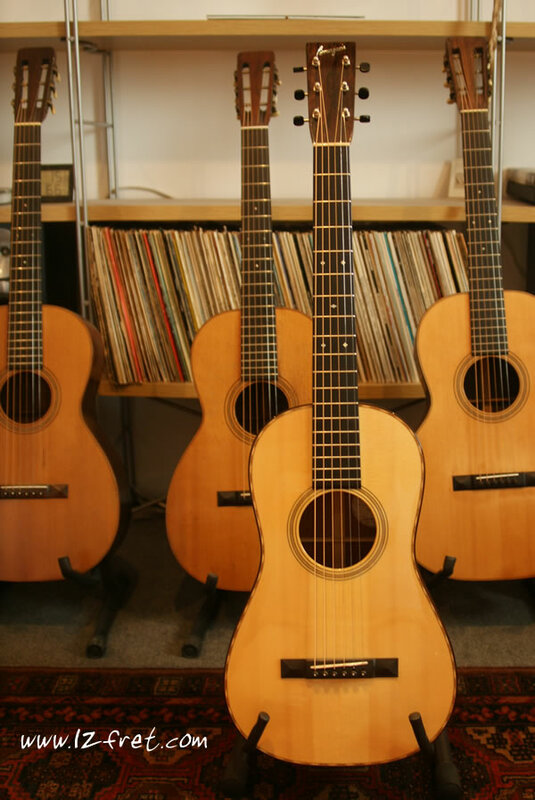 Having been a professional performing guitarist, Campellone understands what a player’s needs truly are. Here we have a Campellone Standard Series 17 inch cutaway archtop, built during 2010 in Greenville, Rhode Island. Our dating of this is based on the serial number – the last four digits seem to be MMYY, so this dates to September 2010. The top is solid, carved top quality spruce with AAAA flamed maple for the carved back, sides and neck. The fingerboard is bound ebony. Hardware includes gold Grover Imperial tuners and a brass – ebony tailpiece and an ebony bridge. A humbucking pickup is mounted on the neck and pickguard, with controls on the guard. The guitar is in overall good condition, with light wear marks. There are a few small marks on the top near the cutaway edge and a few small scratches. Fretwear is light. A black Cedar Creek hardshell case is included. Visit the Campellone Guitars website to learn more about these fine archtops! Serial Number: 3930910, built 2010 by Campellone at Greenville, Rhode Island.